The Department of Philosophy was established in the Gujarat University Campus in 1969 with a single lecturer and developed into a full fledge department, with one Professor, two readers and one Lecturer. This department offers M.A., M.Phil. and Ph.D. courses. Twenty five to thirty students study in the department every year. The department of Philosophy has the privilege of having nationally and internationally known scholars as its Professors and Heads. Professor J.A.Yajnik, who was joined this department in the year 1971, as a Professor, is a nationally known scholar of Philosophy, who was selected as the President of Indian Philosophical Congress, held in Bhuvaneshwar in 1995. He was a member of several committees of U.G.C. and I.C.P.R. He has authored several books and written research paper in English and in Gujarati. Professor J. J. Shukla, who was a Reader, has contributed more than six books in the field of Philosophy. He was also Secretary of Darshan Parishad for several years. Professor Dr. Yajneshwar S. Shastri, Professor and Head, Department of Philosophy at present and who is also the Director of School of Psychology, Education and Philosophy is internationally known Indologist. He has contributed 10 books and more than 70 research papers in the field of Philosophy and Religion. He was Director of International Conference on World Peace held between 29 December, 2003- 2 January, 2004 in Ahmedabad. Delegates from 23 countries from all over the World participated. Dr. Shastri was selected as Sectional President of �Religion� of World Philospher�s meet, organized by the Indian Philosophical Congress, Delhi, 2000-2001. He was also selected as the key speaker by the Indian Philosophical Congress in 1998 to deliver lecture on Vedanta under the auspices of PratapSeth Vedanta Lectures. Dr. Shastri was invited by the different American Universities to teach Indian Philosophy and religions, as the distinguished Indian scholar under the International Scholar Program. He was also invited by the University of California(UCLA), Los Angeles and Cleveland State University (CSU) Ohio, to deliver several lectures on Indian Philosophy in 1998 and I 1995 respectively. Dr. Shastri was one of the panel members of UGC under 9th and 10th Five year Plan. He was selected as the Chairperson in more than 5 International conferences, such as, 1) International Congress of Asian and North African Studies, Toronto University ,Canada 1991; 2) World Philosopher�s Meet held at MIT , Pune,1997;3)World philosophy congress held at Delhi, 2000-2001. He was the only foreign scholar, who was selected as the Chairperson in the First International conference of Philosophy, held in Kuwait University from 4-7 November,2001.He chaired different sessions in 8 national seminars and conferences. He is selected as chief Editor of Isavasyopanisad with 43 Sanskrit commentaries, a research project , taken by the Department of Asian Studies, Loyola Marymount University, Los Angeles, CA, USA. Recently, he was selected as the President, World Peace Foundation, established during the International Conference on World Peace held in Ahmedabad.Dr. Shastri has already successfully guided 8 Ph.D. students and other 7 students are working under him from their Doctoral dissertation. The Department of Philosophy ,through small, is always academically always academically very active in all these years. 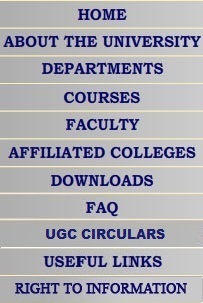 The Department arranged 21 days UGC workshop in 1985. The Department hosted Indian Philosophical Congress 1989. The Department organized International Social Philosophy Congress in 1991.A 2 days regional level seminar on Indian Philosophy was arranged in 1998. The National seminar on Advaita Philosophy (17-19 Feb) was organized by the department in 2000, in association with ICPR. The Department organized a two-day national seminar on Jainism on 10-11 December ,2001. The department has organized International Conference on World Peace from 29 Dec.2003 to 2 Jan.2004, in which 300 delegates from 22 different countries from all over the World participated and more than 200 research papers were presented. The Department has brought out Souvenir and Abstract of papers at the time of conference. The Department has successfully guided more than 50 M.Phil. students and 20 Ph.D. students so far. Seven students are working under Prof. Y.S. Shastri for their Doctoral thesis. Experts in this subject are very often invited to address the students. Assignment system has been introduced along with seminar system to improve the academic standard of the students. Future career opportunity / Placement facility , if any : Lecturer , B.Ed. 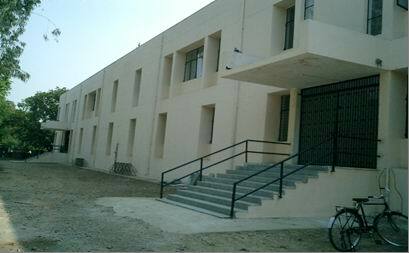 entry, GPSC. Future career opportunity / Placement facility , if any : Ph.D., GPSC, Lectureship etc.